For more 12 volt power supplies click here. This inexpensive 12 volt AC/DC switching power supply adapter is useful for any application requiring UL/CUL approved 12 volts at 4.1 amps or less, but can supply surges up to 6 amps. Model : PST-AC1240 Name : 12V DC Switching Power Supply for Cooler, Car Appliances, mini-ITX computers and other applications. 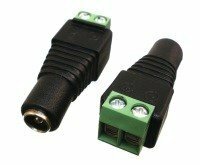 Input Connector IEC C7, Class I input socket allows cords for any country to be used, the North American cord is included. Agency approvals UL, cUL, CE, CCC, ROHS, LPS (limited power source), double insulated, indoor use. Inexpensive 12 volt 4000mA switchmode AC switching power supply AC/ DC converter.